LONDON--(BUSINESS WIRE)--Infiniti Research, a world-renowned market intelligence solutions provider, has announced the completion of their latest list blog on the top challenges in the fashion retail industry. The fashion retail industry has witnessed significant changes in the past few years. Nowadays, fashion is much more than buying useful clothes; it is an expression and extension of oneself. The fashion retail industry is one of the most globally united industries in the world, but because of its indecisive nature, the owners of these brands can find it difficult to thrive in the fiercely competitive industry. In this blog post, we’ll take you through the top challenges in the fashion retail industry that brands and retailers are facing. Infiniti Research is a global market intelligence company presenting market insights to help look beyond market disruptions, study competitive activity, and develop intelligent business strategies. 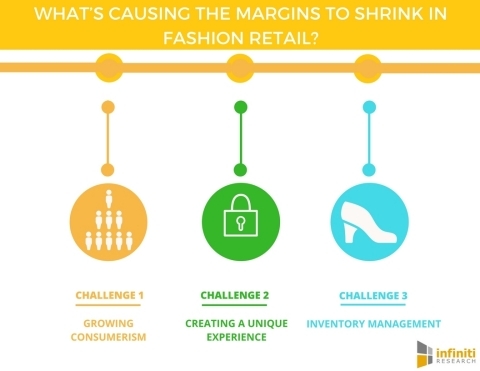 Listed below are the top challenges in the fashion retail industry. Growing consumerism: Nowadays, consumers have too many options from which they can choose any product that they like. They also have access to many channels apart from retail stores like e-commerce platform or mobile commerce. Consumers demand variety and originality; for example, consumers frequently demand apparels they see on media that is worn by their favorite celebrity. So it is difficult for brand owners to offer new collections in a short period, which leads to complications in the supply chain, product development, planning, production, and fulfillment. Creating a unique experience: Players in the fashion retail industry are finding it difficult to create a unique experience for their customers and gain customers’ attention. Brands often obtain superior brand loyalty because they can drive engagement and create positive customer engagement. Fashion retail stores have used numerous techniques to involve the customers in providing in-store entertainment, providing them tablets to research and buy products, and implementing the click and collect model. Fashion retail stores should also focus on store interiors that improve the overall customer journey, leading to sales apart from providing a positive experience. Inventory management: Based on seasons, brands in the fashion industry usually roll-out their new collection. Some brands generally roll out new designs for few seasons in a year, which results in longer time-to-market. In this fast-moving world, the consumer preferences in the space of few months would have changed a lot. External factors, for instance, if the summer isn’t that hot, apparel brands will bring down their prices to dispose the unsold stock. Exhibiting agility and excellence in stock visibility, operations planning, and inventory intelligence is one of the primary challenge faced by companies in the fashion retail industry. Because of fashion industry's indecisive nature, the owners of these brands can find it difficult to thrive in the fiercely competitive industry.